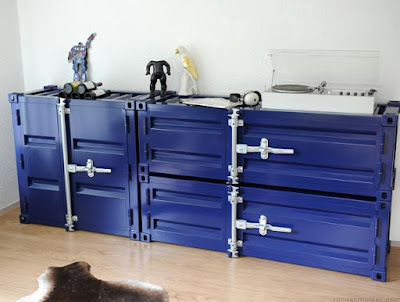 If you have been looking for products to give a touch of industrial look and feel to your room or home, we got you covered. 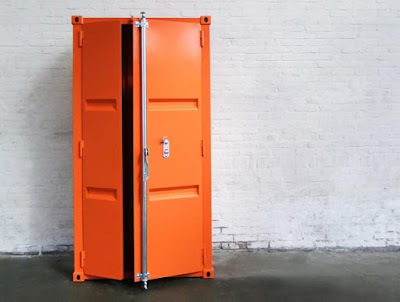 We have the best freight storage container shaped furniture, boxes, storage cabinets and more for you from all over the world. Shipping Container Tissuebox: This cool Shipping Container Tissuebox holds your tissuebox, looks like one of those big shipping cargo containers, except it's a miniature version of it. It's made of iron to make it even more authentic. 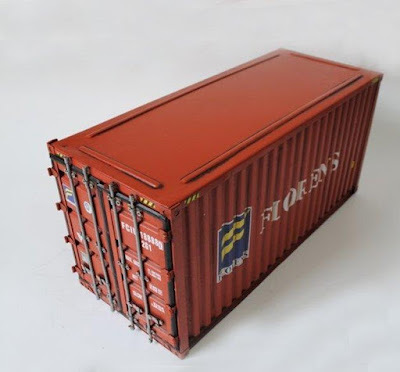 The large shipping container box measures 30.5*12.5*14.0 CM, and the smaller box measures 16.5*12.5*14.0 CM. You can even get your own customized logo screen printed onto these mini-shipping containers if you order 50 qty. Buy Now: $69. 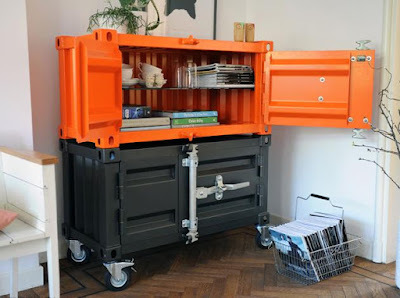 Shipping Container Cabinets: These Shipping Container Cabinets are a contemporary take on industrial freight storage containers by Sander Mulder. These are built to resemble industrial shipping containers, can be placed and rotated to create multiple storage configurations. Buy Now. 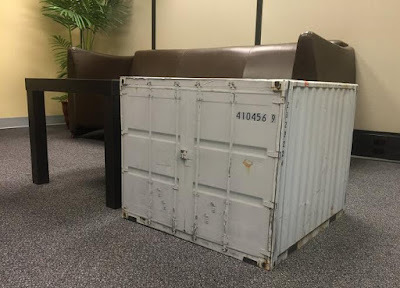 Shipping Container Coffee Table Wrap: Now you can transform a cardboard box into a coffee table that looks like an intermodal shipping container with this cool shipping container adhesive wrap. The intermodal shipping container wrap measures 48 inches x 15 inches x 15 inches, includes the top, two side doors, and two long side panels. Buy Now: $220. 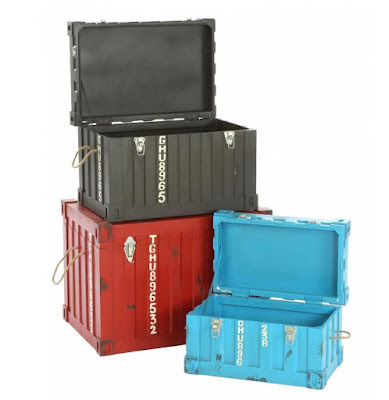 Industrial Container Trunks: These freight container trunks are perfect for creating an industrial style setting in your room. These are handmade from wood and handpainted and the largest trunk is size L70cm x W 50cm x H 50cm. Buy Now: $950. Container Box With Pen Holder: This container box is perfect for your desk; it holds your tissuebox along with your pens. 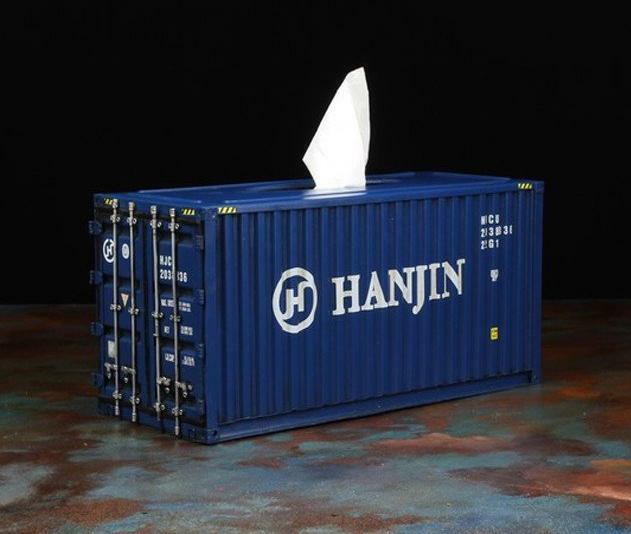 It comes with a tissuebox holder and a penholder. It measures 30.5*12.5*14.0 CM, to give it an authentic industrial look its made of iron. 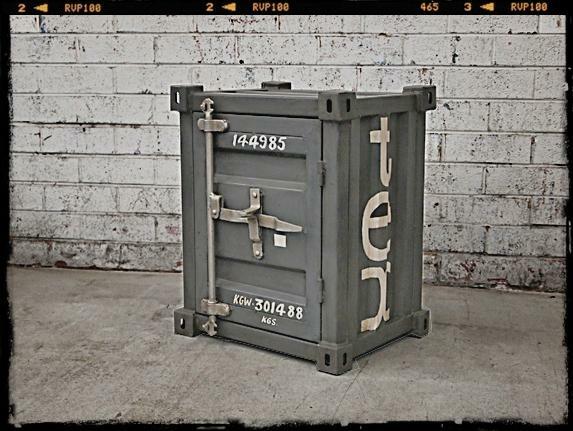 You can even get your own customized logo screen printed onto these mini-shipping containers if you order 50 qty. Buy Now: $75. 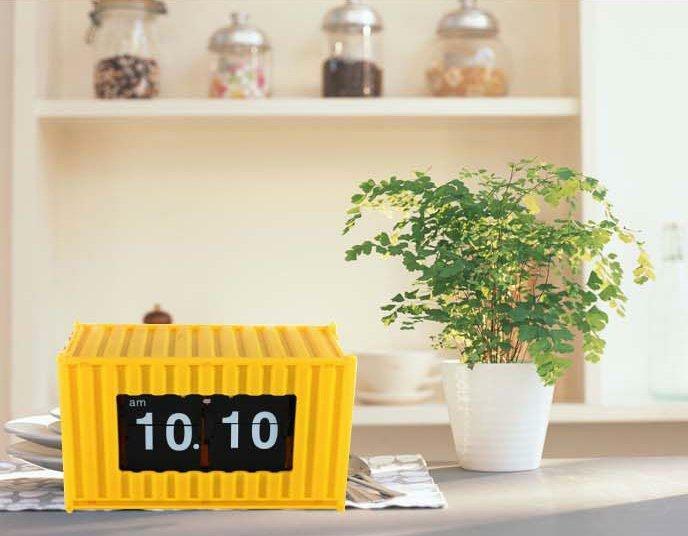 Box Container Auto Flip Clock: The Box Container Auto Flip Clock is perfect to give a touch of industrial setting to your room, it shows time of the original props, similar to sports scoreboard. Buy Now: $99. 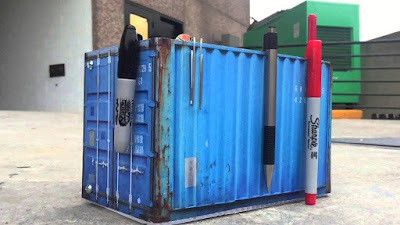 Desktop Shipping Container: The Desktop Shipping Container is made from corrugated plastic, and comes with realistic metal texture printed on the surface. 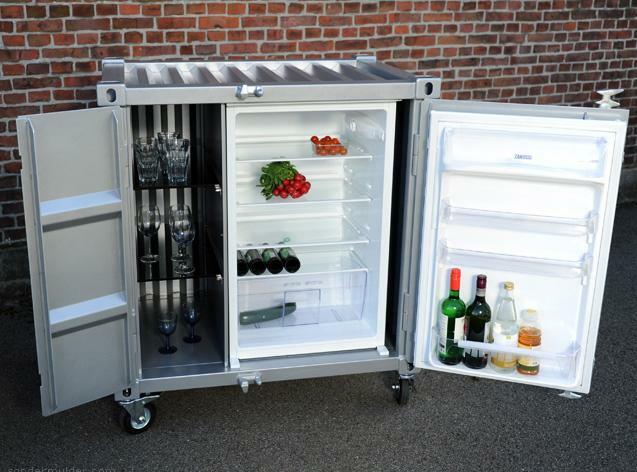 It measures approximately 7.5 in wide by 4.75 in tall and 3.75 in deep. 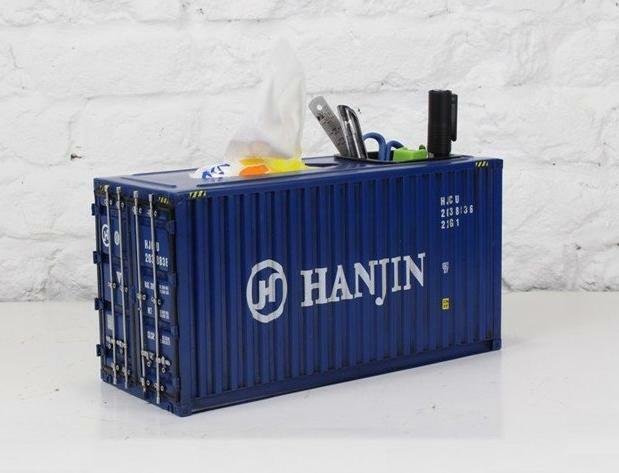 Perfect for keeping your pens, pencils or other desktop instruments within reach. Buy Now: $19.95. Shipping Container Veneer For Ikea Side Table: To get an industrial look in your home, this corrugated shipping container sheath for your Ikea Lack side table is perfect. The 5 corrugated plastic sheets need assembling and the included 8 stickers hold the panels together. Buy Now: $ 149. Industrial Container Side Table: The Industrial Container Side Table is constructed from iron, comes equipped with a removable shelf and a large amount of storage space, and includes a hasp and ring for lockable functionality. Buy Now. Container Lockers: These creative Container Lockers are handmade, to make it look more authentic its made of iron, measures 30*12*14 CM, and are prefect to hold your things. 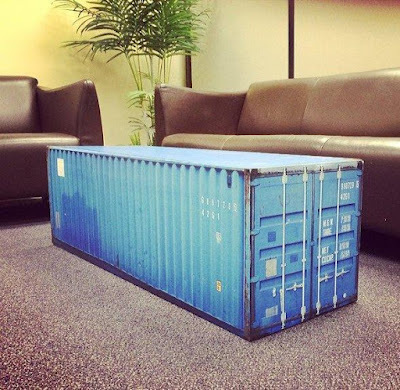 You can even get your own customized logo screen printed onto these mini-shipping containers if you order 50 qty. Buy Now: $69. 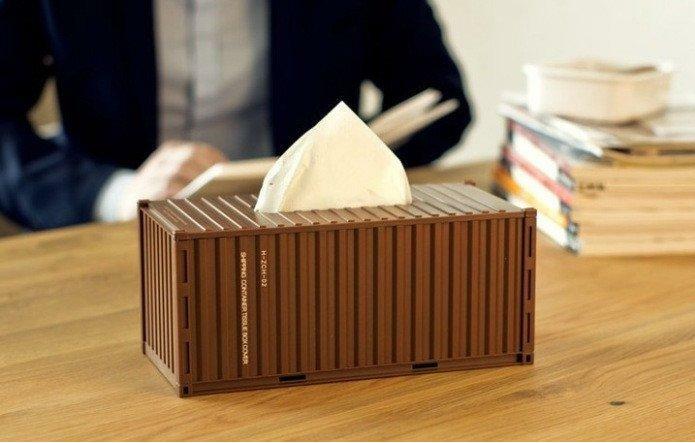 ABS Container Tissuebox: This miniature container holds your tissuebox, measures 25x12x11cm, is made from ABS and available in colors: yellow, green, orange, brown, blue, and red. Buy Now: $15. 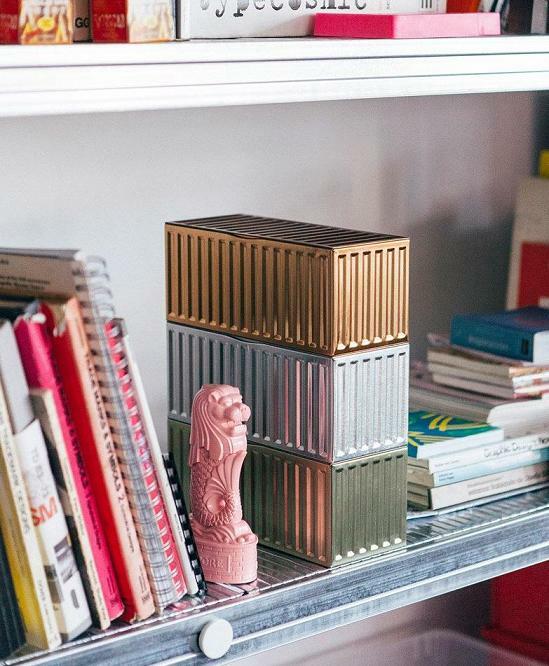 Container Storage Boxes: These cool storage boxes look like a miniature version of the big shipping cargo containers, this metal series is available in silver, gold and copper, perfect for storing your stationary, small things or whatever you want. Buy Now: $45.